Tomato mosaic virus cause yellowing and stunting of tomato plants and cuts yield production. 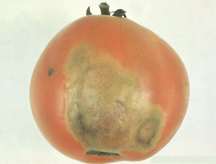 The effects of tobacco mosaic virus on a tomato plant. NO SMOKING ALLOWED IN THE GREENHOUSE. AND NO SMOKERS ALLOWED IN THE GREENHOUSE WHO HAVE BEEN SMOKING OUTSIDE THE GREENHOUSE. NO VAPING WITH E-CIGS OR E-CIG SMOKERS ARE ALLOWED IN THE GREENHOUSE. Anyway you cut it, tobacco is tobacco. 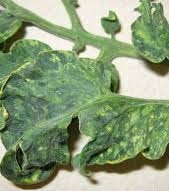 All forms of tobacco, smoke, vapor or nicotine will cause Tobacco Mosaic Virus, Cucumber Mosaic Virus and other blooming plant viruses. No marijuana smoking or marijuana smokers should be allowed in the greenhouse. Smokeless tobacco (chewing tobacco, dip, snuff, pouches) can also carry the tobacco mosaic virus and is transmitted by human hands to the plant material. Since you cannot use any type of insecticide in an aquaponics system (or you’ll kill the fish), you must protect your plants and fish from toxins, pathogens, and insects. We recommend that anyone who touches the gravel or the plants wear clean disposable gloves, every time they work in the farm. We also recommend that NO TOBACCO USERS, NO SMOKING AND NO SMOKERS ever be allowed to handle the gravel or handle the plants (with our without gloves) for fear of introducing the tobacco mosaic virus into the farm. We also recommend all plants are grown from seed because small plants brought in from nurseries hold a high possibility for having been handled by smokers and may also contain aphids and other pests. bumps on the leaves, uneven coloring and stunted and distorted fruit. According to the Penn State link you provided, the virus is not transmitted through the smoke itself, and most, if not all, of the virus is made inactive by flue-cured tobacco (i.e. the processed dry tobacco found in cigarettes). Andrew: You’re correct. The virus from the smoke is on clothing, hair, hands and can be transmitted to plants within a greenhouse. Having LOST entire crops of cucumbers and tomatoes, we’re familiar with the transmission of the virus. If a smoker helped to build the greenhouse dies that present a potential problem of the mosaic virus to flare up when tomato plants are introduced latter? Yes. Tobacco virus affects all blooming plants through a spreadable virus.